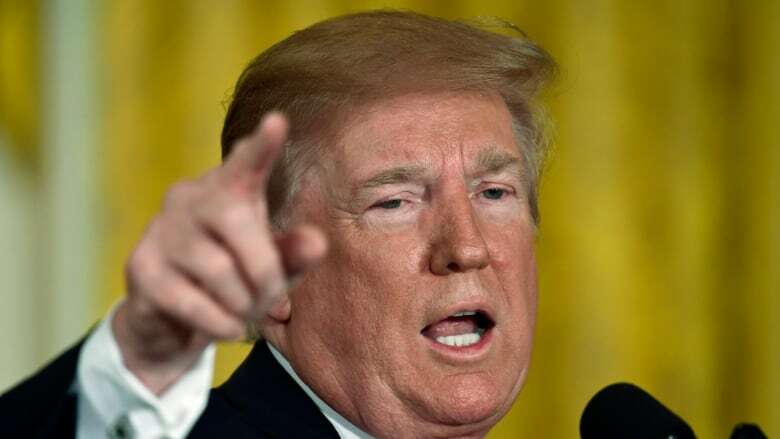 President Donald Trump on Friday threatened to escalate a trade war with Europe by imposing a 20 per cent tariff on all U.S. imports of European Union-assembled cars. President Donald Trump on Friday threatened to escalate a trade war with Europe by imposing a 20 per cent tariff on all U.S. imports of European Union-assembled cars, a month after the administration launched an investigation into whether auto imports pose a national security threat. "If these Tariffs and Barriers are not soon broken down and removed, we will be placing a 20% Tariff on all of their cars coming into the U.S. Build them here!" Trump wrote on Twitter Friday. Trump's tweet on autos came after EU reprisals against his tariffs on European steel and aluminum. The EU targeted more than $3 billion US in American goods exported to the 28-member European Union. The United States currently imposes a 2.5 per cent tariff on imported passenger cars from the European Union and a 25 per cent tariff on imported pickup trucks. The EU imposes a 10 per cent tariff on imported U.S. cars. German automakers Volkswagen AG, Daimler AG and BMW AG build vehicles at plants in the United States. Industry data shows that German automakers build more vehicles in southern U.S. states that voted for Trump in the 2016 presidential election than they ship to the United States from Germany. The European Autos Stocks Index fell sharply after Trump's tweet and was last down 1.25 per cent. Shares of U.S. automakers Ford Motor Co and General Motors Co shares fell immediately after Trump's tweet but rebounded and were trading higher. The U.S. Commerce Department is investigating whether imports of automobiles and auto parts pose a risk to national security. Two days of public comments have been scheduled in July, and Commerce Secretary Wilbur Ross said Thursday said the department aims to wrap up the probe by late July or August. Tariffs on car imports would add to an array of trade wars Trump has started, saying he aims to create U.S. jobs and protect domestic industries. Trump has threatened duties on up to $450 billion US of imports from China. Administration officials have said China should strengthen protections for U.S. companies' intellectual property, and reduce tariffs on U.S. products. The move against China could raise prices for American consumers and businesses and hit global supply chains for industries like carmakers and electronics. Chinese reprisals have hit American farmers already. Trump's trade policies have also escalated conflict with Canada and Mexico as he seeks to renegotiate the $1.1 trillion North American Free Trade Agreement on terms more favourable to Washington. German automakers did not comment on Trump's tweet. German auto industry association VDA said Germany exported 657,000 cars to North America, 7 per cent less than a year earlier, and 200,000 fewer cars than in 2013. Sales to the U.S. fell 10 per cent to 494,000 vehicles, while Germany automakers produced 804,000 vehicles in the United States last year. Automotive News data shows about 7.2 per cent of vehicles sold in the United States through May were assembled in Europe.